So, you’ve named the big day and started to go through the list of things to organise to make sure your wedding is perfect and your thoughts are likely to turn to such things as flowers, dresses, churches and your wedding makeup. It’s time to look for a bridal makeup artist to give you the perfect bridal makeover. Kent is my home county and, with my base just outside Tunbridge Wells, I can cover weddings within the surrounding areas of Kent with ease. You’ll want to look your best on the day and, along with your hair and your dress, your makeup will play an important part in making you feel like every beautiful bride should feel. Of course you can take care of your own makeup on the day but wouldn’t it be easier, and one thing less to worry about, to have an experienced wedding makeup artist on hand to take care of everything and make you look a million dollars. First of all we’ll have a trial marriage makeup session and consultation. We’ll chat about what you want from a bridal makeup artist, the styles you like and try out some different looks. This should ideally take place within the last three to five weeks before your wedding day so that there is less likely to be any major seasonal changes but is not too last minute. On the day of your wedding, when we come to do your bridal makeup it’s best to allow up to an hour for the actual application. I can fit in around all the other preparations for the day. During the trial session we’ll need to chat about the style of your wedding dress and the colour to ensure we blend it perfectly with your bridal makeup. If it’s white it would be helpful for you to wear a white t-shirt or top for this trial to ensure that your makeup works against the pale colour of your wedding dress. If you are considering the use of fake tan to give you a healthy glow on your big day, it would be a good idea to apply this before the trial session, as would any changes to hair colour, as these are likely to have a bearing on your choice of makeup colours for your wedding, especially when it comes to foundation and blusher. Another consideration when it comes to bridal makeup is to ensure that your makeup can withstand the rigours of a few tears, much kissing, plenty of sipping, not to mention the weather, be it a sun-drenched beach, a candlelit church on a snowy winter’s day (or somewhere in Tunbridge Wells) and still make you look drop dead gorgeous on all your wedding day photos. Whether you are based close to my home town of Tunbridge Wells or further afield, I can offer my wedding makeup artist services throughout Kent or indeed down to the Sussex coast. 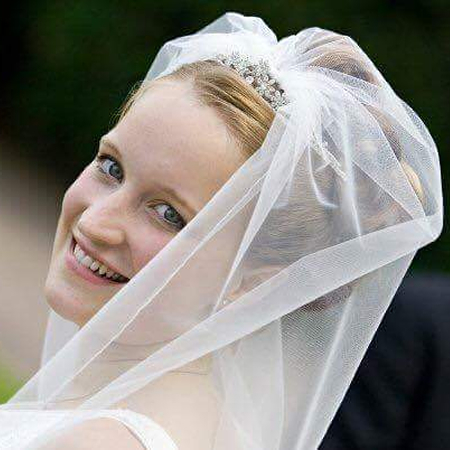 If you are planning your wedding and looking for an experienced bridal makeup artist in the Kent area then please get in touch for your bridal makeover.